In 2001, Carla was asking herself, “What did I do wrong?” She was on the brink of a divorce with a two year old daughter to support. She had left most of her possessions, including all furniture, in the house previously shared with a soon to be ex-husband. She had no idea how to move forward with her life. Carla lived in the 4th largest city in the country and her closest relative was over 240 miles away. In 2007, Carla brokered a deal in which she purchased the staffing firm she had worked at since college. She quickly overhauled the business structure and implemented the strategy she calls, “People Over Profits, Take Care of the People and the Bottom Line Will Grow”. By 2009, the firm was on the Houston Business Journal’s list of Houston’s Largest Minority-Owned Businesses and in 2014 the firm was 28th among the University of Houston’s “Cougar 100,” a list recognizing and celebrating the 100 most successful Cougar-owned companies. When asked the key to her business success, Carla replied, “The elements having the most impact on my life are Roots, Family and Education”. These are the cornerstones of This Woman’s Work (TWW), a non-profit founded specifically to help women improve their economic independence and emotional well-being through an innovative series of programs designed to provide support to women as they work to improve their lifestyle and financial position. Founded by Carla in 2010, the non-profit was inspired by the needs she saw in her employment business where women were applying for jobs they weren’t ready for, didn’t have the proper clothing or just needed other support to create a better lifestyle for themselves and their family. Never forgetting the elements that pulled her through her most trying time, Carla started TWW, along with Carla’s Closet to help inspire women to continue to improve themselves and the lives of their families with support on their journey from the community. In January of this year, TWW expanded its programming to include female mentoring. 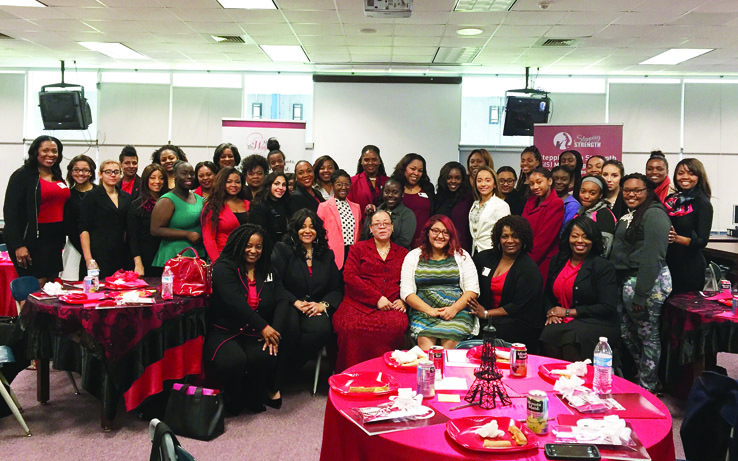 The Stepping Into Strength (SIS) mentoring program is the result of the collaboration of Michelle Lewis, Assistant Principal at Madison High School in Houston, TX and LaneStaffing, CEO and TWW founder Carla Lane. SIS’s programming was created by Michelle. The program builds and develops young girls in the community to become resilient, fearless, educated and empowered. These skills will support them to become women who make self-sustaining decisions to enhance their lives. The program encourages teen girls to dream beyond their current situations. The vision of SIS is to thrive as a national and global mentorship program dedicated to the enrichment and empowerment of young girls. The program serves as an avenue of infinite possibilities. Mentees benefit from exposure to an expanded potential for their lives and what education has to offer them. IronWomen mentoring is TWW’s peer mentoring program. “As Iron sharpens Iron, so one sharpens another.” When iron blades are rubbed together, each becomes sharper and thus more effective. They believe that mentoring sharpens not only the mentee but the mentor. This volunteer movement aims to inspire women to reach out to other women and, through the simple act of offering guidance and insight, help them achieve their personal and professional aspirations. Mentoring another person is one of the greatest gifts one could give to another and there’s almost no better feeling in the world than to help another person accomplish their dreams. They believe you get what you give and the more you mentor the more the rewards come back to you, only multiplied. They envision a world where women actively reach out to other women and offer their professional and personal support; mentoring women to success. The goal of the program is to eliminate negative competitiveness and encourage positive assistance, woman to woman, one woman at a time. TWW envisions a community where women and girls are empowered by access to career opportunities, programs and long-lasting relationships. Join the movement! Visit them online at thiswomanswork.biz.